Many Filipinos are in the dark about their pre-colonial past, or Philippine history before the Spaniards came. That past is coming to light with Amaya, the first prime-time teleserye about Philippine society and culture before Europeans knew these existed. But even that history is based on what Spanish chroniclers wrote about the islanders they called indios. A recently discovered stone may change all that. 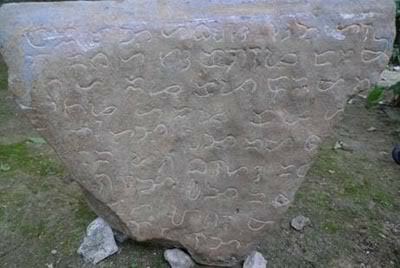 A doormat for many years outside a Masbate classroom, the stone slab was cleaned by school children, revealing beneath the hardened mud writing in the ancient Filipino script called baybayin. Is it really a window into our pre-colonial past, or simply the work of a more recent hobbyist? Howie Severino and his documentary team accompany scientists to Ticao Island in Masbate as they try to authenticate the stone’s origins and unlock its secrets. What does the writing say? Their investigation leads Howie’s team’s to living baybayin writers in Manila trying to keep the ancient script alive, convinced that it is an essential element in Filipinos’ modern identity and a way for them to stand tall in a globalizing world where many languages, and the cultures they represent, are vanishing.